Home › Stories › What is Happening to the World's Polar Bears? Polar bears have long captured our attention, but probably at no time in the past have they been more in the forefront of the public's attention than today. The international organization, Polar Bears International, predicts that if current warming trends continue in the Arctic, two-thirds of the world's polar bears could disappear by 2050. Today's heightened interest in polar bears may be due in part to an enhanced understanding of the current global warming at the polar ice caps, as well as polar bear ecology and the recent issues regarding whether they should be considered endangered. Recent efforts to communicate these concerns, research and statistics have been made to the public to help heighten the public awareness. Results of years of research and studies are now available to an interested public, and efforts to communicate this information to the public have been more effective in recent years than in the past. Polar bears are not a single large homogeneous population, but are rather comprised of groups referred to as stocks or populations, which are distributed throughout the Arctic. The first extensive research began in the late 1960s and has made significant progress today. We now have a thorough backdrop of information on population demographics, systematically analyzed data on population boundaries, population movements, population size, reproductive and survival parameters, and other useful information about biological, physiological, and ecological aspects of polar bears. Research indicates that polar bears do not occur in large numbers. In addition, their ability to replace individuals in the population is very limited and population growth is extremely slow; however, they are long-lived creatures, which helps to offset the low reproductive potential. Polar bear populations fluctuate in response to natural factors such as climate and prey availability. Populations can also be impacted by humans through factors such as hunting, oil spills, shipping, and other activities. Advances in satellite telemetry and other advanced technology have helped researchers track polar bear patterns more definitively, which has greatly enhanced our knowledge of movements and population bounds. The Arctic ecosystem is heavily vulnerable to climate change. 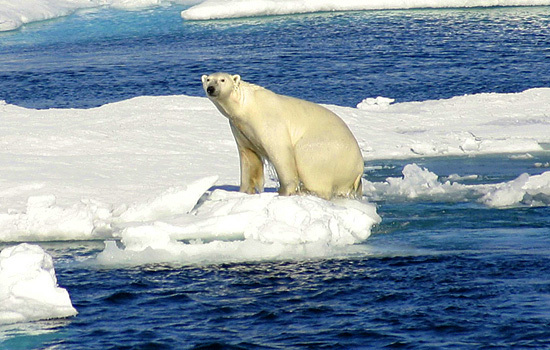 With the increasing warming occurring at the polar ice caps, many species are being affected. Polar bears serve as key indicators of this as their populations are being reduced significantly in recent years. Today, polar bear populations are facing threats previously unprecedented during recorded history in the Arctic. According to the World Wildlife Organization, recent climate change scenarios based upon aggregate climate trend data predict that the Arctic region will experience major changes in the upcoming decades. To get an idea, the Arctic basin's ice thickness has already decreased by 40% over the past 30 years. The average annual extent of ice coverage in the polar region has also diminished substantially, with an average annual reduction of over 1 million square kilometers. With ecological impacts facing the arctic polar bears, it's necessary that we warrant their future protection. If you've ever dreamed of experiencing polar bears close-up or would like to learn about them in their own environment, Cape Churchill, Manitoba, Canada is known as the "polar bear capital of the world." In October and early November, polar bears gather at Cape Churchill and wait for ice to form on the Hudson Bay. If you're interested in discovering these magnificent creatures up close, then check out our Canada vacation packages so you can gain the polar bear experience of a lifetime. Need more information on What is Happening to the World's Polar Bears?? Talk to one of our Canadian travel Insiders who'd be happy to answer all your questions.